Is it time to break up with your office chair? Expert advice on why, how and when to make the shift to a standing desk. Many people claim that standing helps them feel more energetic and productive, and there are recent studies to show it can be good for your health. If you’re thinking of disowning your chair, here are a few things you need to know. When we sit, our muscles go still, we burn fewer calories, make fewer enzymes to break down lipids, and our insulin effectiveness decreases, making us more susceptible to Type 2 diabetes and obesity. This new evidence has led some researchers to call sitting the new smoking, and to say that sitting, in itself, is a lethal activity. When we’re standing, the increased blood flow boosts brain activity and cognition to make us more productive. You know when you’re struggling with a problem, get up from your desk, take a few steps, and realize the answer? That epiphany was likely the result of increased blood flow to the brain. Standing can help us tap into that productivity without leaving our work stations. So, stand up and push your chair aside, do some leg lifts, some neck rolls, and let’s get started. Researchers at Cornell University recommend starting with the 20-8-2 rule. That means you should sit for 20 minutes, stand for 8, and walk or stretch for 2. All that standing puts a strain on the veins that run up and down your legs. And Feinstein says, the most important and overlooked part of the transition to standing is the purchase of a high-quality cushioned mat – like the ones chefs, grocery store checkers, and other people who stand all day use – for under your feet. Some people choose to lean on ergonomically designed stools or even have balance boards to work on core strength during the day. So, roll back your shoulders, open your chest, do some midafternoon squats, and let’s set up your new desk. 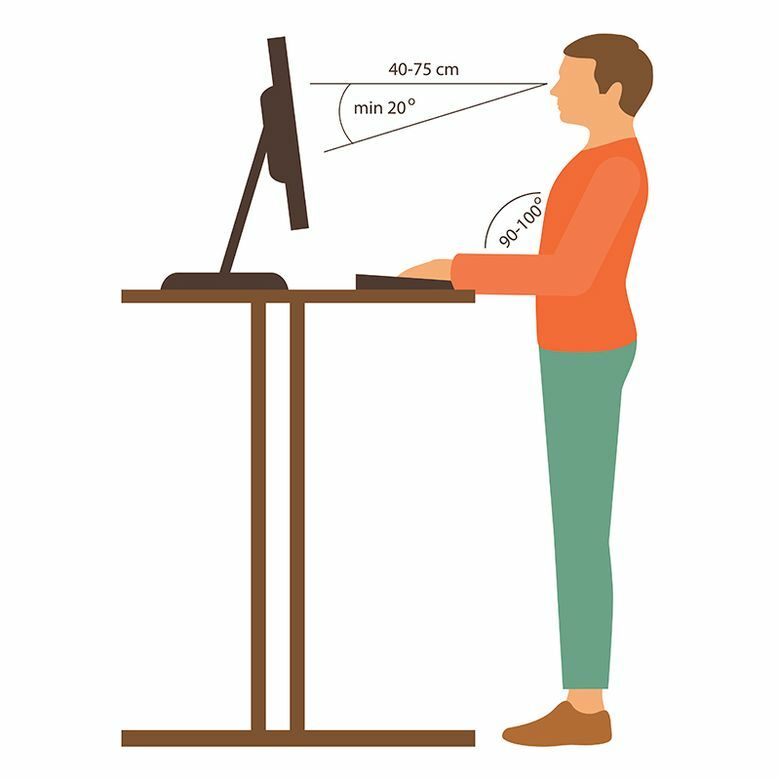 According to Feinstein, when standing, your desk surface should be at a comfortable height that allows your palms to rest on the keyboard with your elbows bent at a 90- to 100-degree angle. The top quarter of your monitor should be eye level, and when you stick your arm out straight from your shoulder, your fingertips should barely touch the screen. An adjustable monitor stand can come in handy to get the setup just right, especially when you’re moving the desk up and down throughout the day. We all know that sitting at our desks all day is not the greatest thing, so get up, push aside your chair, and give a standing desk a try. Then sink into that cushioned pad, stretch, stand in the yoga tree pose, or do whatever you need to get moving. Not only will it help you feel better, but it might just help jar loose some new ideas. After all, if it worked for Hemingway, perhaps it’ll work for you, too.